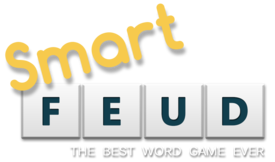 SmartFeud is the new Scrabble. More fun, better and more exciting. We give you some game tips to get the highest scores. Try to pick and use a letter from the board every round. Try to grab a letter from the middle of a word. For example the ‘A’ from the word ‘TABOOED’. ‘BOOED’ remains, and counts for your score. As does the new word you used your ‘A’ for: ‘LAUGH’. That’s worth a laugh. An ‘S’ can be taken away from many words. Runners, thinkers, and so on. That is a fast way of scoring. You can replace a letter with the same letter from your rack. Especially if you take a letter from a long word, and if it was placed on a double or triple word value, it can go real fast. It is useful to learn a lot of words with a Q and K by heart. Before you start puzzling, try first to find out which letters you can potentially take, and also look at the letter value. Blanks can come in very usefull. Use them wisely! Using all your seven letters plus one that you took from the board gives you 50 point bonus. If you do not take a letter, but manage to use your own seven letters, you still get a 30 points bonus. That’s nice. Try to swap a tile with the same letter. We call it ‘the swap’, and it can score a lot of points! Always pay attention to the premium squares. Especially when you play with the game board in ‘random’, they make the difference. Not all words need to be attachted to oneanother. It may happen that there is a loose word somewhere on the board. Use this. Also look at what letter your opponent has taken away. Maybe you can put that letter back, and have a quick score! There is plenty of options to use the SmartFeud features. It’s easy to understand, but hard to master. Enjoy!